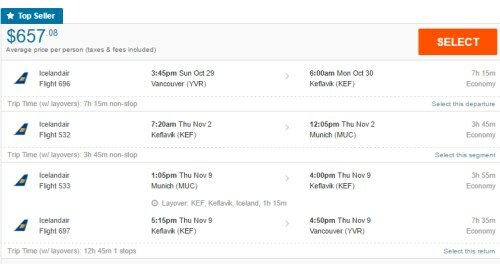 Icelandair has dropped the price of their off-season flights from Vancouver to Munich, Germany down to $638 CAD roundtrip including taxes. This is about 43% below the typical best roundtrip prices from Vancouver to Munich - even for the off-season. These flights are also pretty close to as fast as Vancouver to Munich can be done. Even if it is off-season dates, it's nice to see Icelandair starting to offer some great prices from Vancouver to Europe like they have from Edmonton and Toronto for years. For some reason, they've never been as generous with their price drops from Vancouver. But recently they've been offering cheap flights to Denmark, Norway, and Sweden. You can also turn these into a 2-in-1 trip with Iceland, and spend time in both Munich and Iceland, for $19 more. You can also find similar prices to Frankfurt (FRA) on the same dates. Flighthub calls the Reykjavik airport Keflavik (it's official name). Don't worry, KEF is definitely the Reykjavik airport, and the only airport you can fly into in Iceland. vancouver, yvr, flight deals, europe, northern europe, icelandair, germany, central europe, western europe, nordic countries, reykjavík, iceland, kef, munich, muc and reykjavik.